You know that you have to brush your teeth every day to keep your smile healthy. However, your toothbrush needs to be in good shape to clean your teeth. As your toothbrush ages, it is less effective at cleaning your mouth. 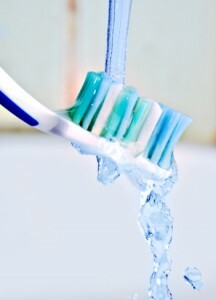 In this blog, Dr. Ganjoor explains proper care to get the most out of your toothbrush. The American Dental Association recommends replacing your toothbrush every three to four months (or sooner if the bristles wear out). When your bristles fray, they are no longer strong enough to thoroughly remove plaque from surfaces of your teeth. Furthermore, worn bristles become rough and irritate your teeth and gums. Irritated gums can recede from the teeth, increasing your chances of tooth decay and gum disease. Replacing your brush every three months will reduce the potential of bacterial buildup contaminating your mouth. You should also replace your brush following a cold, virus, or oral infection to avoid becoming re-infected. Bacteria thrive in moist, enclosed environments, so you shouldn’t cap your toothbrush after use. Instead, store it upright and open so it can air-dry. Make sure the brush is completely dry before the next use, and if it is not dry, rinse it thoroughly before topping it with toothpaste. In addition, you should keep your toothbrush at least six feet away from your toilet, and always close your toilet lid, to avoid airborne bacteria during flushing. Never share a toothbrush, and if you store more than one brush in the same area, keep them a safe distance from each other so that germs are not transferred. You should also avoid soaking your toothbrush in a disinfectant or touching your brush to the toothpaste tube that others may use. To clean your toothbrush, place it in a cup of water and microwave it for two minutes. Proper toothbrush care and regular visits to Dr. Ganjoor will help keep your smile healthy. Contact Celina Family Dentistry at (214) 851-0130 to schedule an appointment. We welcome patients from Celina, Prosper, Gunter, Frisco, Anna, Pilot Point, McKinney, and surrounding communities.